Want to try the oak-fermented tart beer brewed in Wichita that won a silver medal in the 2016 Great American Beer Festival, the world’s largest commercial beer competition? How about the locally roasted Boneshaker Espresso, which earned a bronze medal among national roasters last year? The second installment of Visit Wichita’s Wicked Brew Tour, a tasty summertime exploration of locally crafted coffee brews and beer, launched in early June and runs through September. Based on last year’s participation, though, you should plan your sip trip sooner rather than later. The tour was so popular with locals and out-of-towners, the T-shirt supply ran out quickly. New on the tour this year: a cool, new T-shirt design, one additional coffeehouse and three new breweries. The artwork on the shirt, designed by Josh Tripoli and Rebekah Lewis, pulls in iconic Wichita imagery, including the Wichita flag. The pair also designed the popular mural on the west wall of College Hill Deli, which Visit Wichita sponsored, and has become one of the most popular spots to take a picture in Wichita. 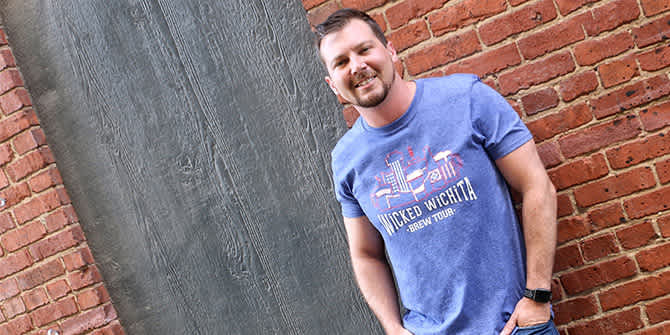 Get at least eight of the 15 locations on the passport stamped and then turn it in for your Wicked Brew T-shirt at Visit Wichita, 515 S. Main, Suite 115. If you’re truly dedicated to seeing what Wichita’s craft beverage scene has to offer, push yourself to get all 15 stamps and try something new at each stop! Those who prefer to partake in coffee brews only can present their passports with all seven of the coffee shops stamped and receive a T-shirt. The tour ends in September, or until Visit Wichita runs out of T-shirts. Please enjoy the Wicked Brew Tour of Wichita safely. Our city has a number of transportation options, including the free Q-Line trolley and its newly-expanded routes. Click here for a list of transportation options and maps of Wicked Brew Tour locations. Share your experiences on your own Wicked Brew Tour by using hashtags #BrewTourICT and #ICTmoments on social media.